Windham’s Duane Clark Memorial Scholarship Committee has expanded its community giving to include the highly-regarded Everlasting Gratitude Program. E.G. places patriotic red, white and blue ribboned wreaths at the graves of all Windham veterans each December. 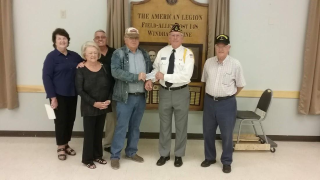 At a recent formal gathering at the Veterans Center in North Windham, Stan Page, a Vietnam veteran and chief fund-raiser for the Duane Clark Committee, presented a check for $500 to American Legion Field-Allen Post 148 Sgt. At Arms Larry DeHof. All contributions to E.G. are dedicated to the wreath project; funds raised beyond the approximate $6000 annual cost for wreaths and materials are applied to the following year’s project. Everlasting Gratitude began in 2014, the brainchild of Libby Sawyer of Studio Flora (Florist & Gift Shop). Libby, her family, local organizations and individuals pitched in as volunteers to create what would become an annual event to adorn over 800 gravesites in twenty-plus cemeteries throughout Windham. In its third year, the Legion Post offered to help with fund-raising and wreath laying. There is now a determined commitment to carry on the program as an annual tradition – a tribute to all Windham veterans. The namesake of the Duane Clark Memorial Scholarship was a member of the Windham High School Class of 1964. He died in a road crash in 1971 at the age of 24. His grief-stricken classmates launched a scholarship in his name which has been awarded to a deserving Windham High School senior for over 45 years. Funds are raised through the annual antique auto show at Windham SummerFest, and by individual donations. Julia Cheney, treasurer of the Clark Fund, said Clark was a very special person. He was a stellar athlete and an outstanding school and community citizen who treated everyone with respect.